1. Find a quiet place–It’s easiest to meditate when you can find a time and place where you won’t be interrupted. This is a time just for you. You might go into your bedroom and shut the door, for example, signaling to family or roommates that you want to be alone. You might also want to choose a time of day when the environment is less busy. Some people find getting up 15 minutes early to meditate before everyone in the house is up is a great time to practice meditation. 2. Close your eyes and focus inward–Sit comfortably and close your eyes, focusing on this present moment. You don’t need to sit cross-legged if that isn’t comfortable. You can sit in a chair, on the floor, or even lie down, if you can stay alert. Once settled, notice how you feel in your surroundings. Focus only on the moment right now. 3. Focus on your breath--An easy way to focus on your breath is to bring your attention to your abdomen. Feel it rise and fall with each breath. Or, you can focus instead on your nostrils, feeling the warm air coming out of your nose and the cool breath going in. If you are having trouble focusing, you can even think to yourself on the inhalations, “breathing in” and, “breathing out” on the exhalations. Start meditation practice by focusing on your breath and connecting with your body. Take a break during your day to cultivate self-awareness with meditation. 4. Connect with your body–Once settled and focused inward, take notice of your body. How does each part feel? You may want to scan your body, starting with your toes and going all the way up to the top of your head. Just notice and really feel the sensations in your body. Notice tight spots, warm places and places that feel comfortable. Remember, there’s no need to change anything about how your body feels. You are just noticing. 5. Notice thinking–When your mind wanders, and it will, that’s okay. That’s what our brain is meant to do. When you notice you are thinking instead of focusing on your breath, simply bring your mind gently back to the breath. This is mediation–bringing your mind back, over and over and over. After practicing meditation for a while, you will notice that your mind wanders less and less. 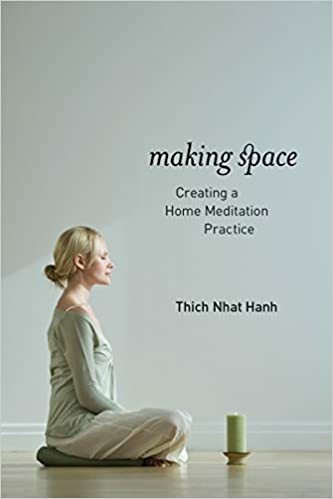 Beginning mediators find it soothing and relaxing to just take a few minutes once or twice a day to stop the busyness of life and check in with themselves. It’s an easy way to take a break, clear your mind and be able to go back to your normal activities refreshed. You only need 5 or 10 minutes to start enjoying the benefits meditation has to offer.